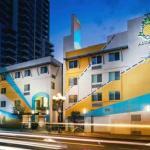 Cheerful yellow rooms offer free Wi-Fi and flat-panel TVs and guests are right in the midst of the dining and shopping district at San Diego's non-smoking Staypineapple at Hotel Z. The non-smoking Hotel Z pays homage to the hospitality-friendly pineapple with its perky yellow accents. The 96 modern rooms on four floors feature free Wi-Fi 40-inch flat-panel TVs and coffeemakers and sleek bathrooms offer yellow robes and slippers. Pets are welcome for a fee and are treated to dog beds water bowls and treats. Guests can hop on a complimentary yellow bike to wander the city neighborhoods and valet parking a 24-hour front desk and a business center round out the amenities. Hotel Z is perfectly positioned in downtown San Diego. Within 10 minutes guests can walk to many destinations including the San Diego Convention Center Petco Park and the Westfield Horton Plaza. Local restaurants line the surrounding blocks and both the San Diego Zoo and Natural History Museum are within two miles. Other interesting stops include the USS Midway Museum a mile away and La Jolla Beach a half-hour drive. Transportation options include the bus less than a block away and the light rail a five-minute walk from the hotel. San Diego International Airport is less than four miles away.